We created this website to give Edgewater residents a chance to share our preliminary vision for the proposed development of the former Hess Corporation petroleum storage terminal on River Road. For more than 60 years, the 615 River Road site was encumbered with giant oil tanks over 60 feet tall that blocked public access to the waterfront, obstructed views and crowded River Road with truck traffic. Our concept is to open up the site to the public with large parks on both the eastern (waterfront) and western sides of River Road. Designed by an internationally known landscape architect, the parks will feature a variety of plantings and flower beds along with seating and walkways and will provide sweeping views of the NYC skyline and the Hudson River. Our plan includes restaurants and cafes directly on the river and contoured areas that provide amphitheater seating along the shore public walkway. We will also provide a bus “super stop” with shelters from the weather and turn off lanes to reduce traffic congestion; a ferry stop with public parking; and public parking to access the parks, the retail stores and the ferry. 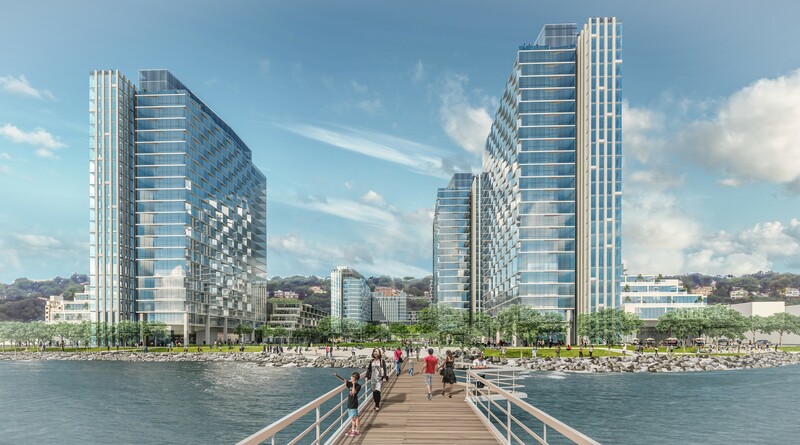 The site plan was designed to maximize public space and views of the river while using the same density factor provided by the Borough for many other sites. A world-class architect was hired for our project because we wanted to bring the highest quality building design to the Borough. If approved by the municipality, this project will not only provide many amenities for residents but will generate millions of dollars of tax revenues for the municipality. We invite you to review the website and learn more about our proposal and how it will benefit Edgewater. If you have questions, please click on the question tab and you can email your questions to us and we will respond as quickly as possible. © 2019 615 River Road Partners. All Rights Reserved.